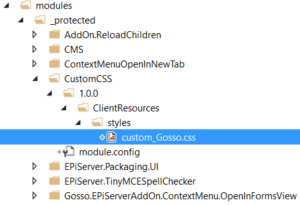 2 min reading how you can customize and override the CSS in Episerver UI admin with help of module system. In Quan Mai book, Pro Episerver Commerce, which I highly recommend for good understanding of Episerver Commerce platform, he mention under chapter 3, page 55, that you can override the CSS to put a height on the image, since there is no default height on images in Catalogue UI. In my case the proportion of the thumbnails wasn’t default, so I needed to override, but how? 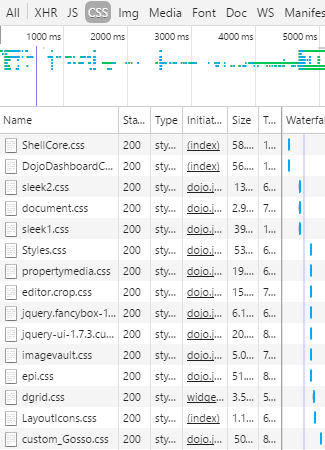 If you have more modules attached to your solution and if you need to have yours latest, check the loadings of css, and try to figure out what the name of the Module loading it is. Check in their module.config. And yes, you may override scripts too.